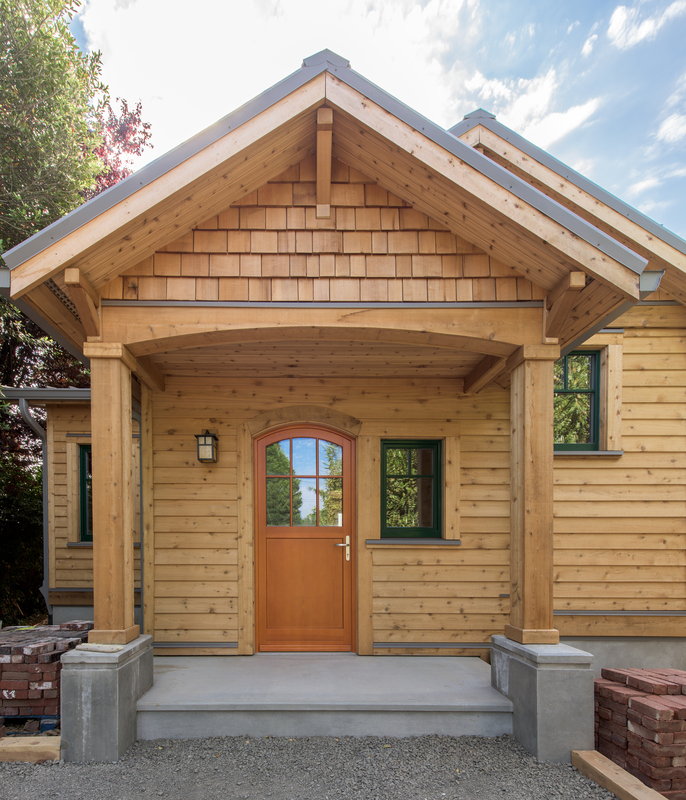 The Carlsson Family Home is a 3,157 square foot home built by Birdsmouth Construction in Portland Oregon. Construction began in July of 2014 and the home was completed in June of 2015. The original home was a 1925 craftsman that had a poor foundation, uninsulated walls, single pane windows, an old gas furnace and a leaky composite shingled roof. The clients were Swedish and had a goal of a quiet, comfortable, high quality home that would last generations- similar to the homes they had lived in back in Europe. Their goals also included being as energy efficient as possible. Birdsmouth worked with the architect, Ray and Beate Cully of R&B design group to create a home that would meet Earth Advantage Platinum and Net Zero Home certifications. The home was lifted off of its old foundation and excavated to increase its footprint. A new foundation and slab were poured with 3” exterior EPS foam to the outside of the foundation walls, and 6” of EPS insulation under the slab and footings. The home was placed back down and the original first and second story floor systems were preserved. All existing 2x4 walls were furred out to 5.5” and new walls were all 2x6 construction. These were sheathed with Zip System sheathing, and the joints and seams were sealed with the Prosoco liquid flash system. 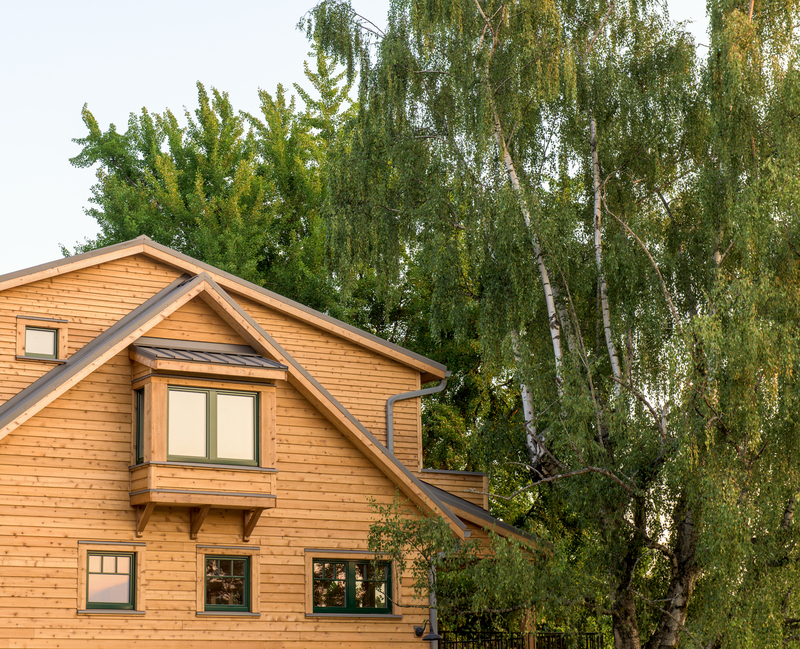 To the exterior of the sheathing, Birdsmouth added 2” of cork insulation followed by a fully vented rainscreen assembly and cedar lap siding. The interior wall cavities were filled with 5.5” of dense pack cellulose. The roof assembly was built from 2x12 rafters, which the wall sheathing went up and over. This allowed for dense pack cellulose in the vaulted ceilings. Over the sheathing, which acted as the primary vapor control layer and the air barrier, 2x6 rafters were installed to create a space for 3.5” of rockwool insulation and a vent space. The tails ran long over the wall plane to create the overhangs for the building. This was then sheathed and a metal roof was installed. Soffit vents and a ridge vent provided for ventilation of these cavities. Triple pane Zola windows and doors were used, including 3 large lift slide units. The average U value of the windows is U.12. The windows were installed into the rough openings with Hanno Band expanding foam tape. The final blower door test out was a .5 ACH50. To provide for ventilation and heat recovery a Zehnder Comfo Air HRV was installed and balanced. For heating/cooling a 15,000 BTU Mitsubishi ducted mini split heat pump was employed. Water heat is supplied by an electric tank style water heater. To offset the energy usage, a 7kW solar array will be installed on the garage. The original home was a 1925 craftsman that had a poor foundation, uninsulated walls, single pane windows, an old gas furnace and a leaky composite shingled roof. 100% of the building was rebuilt. 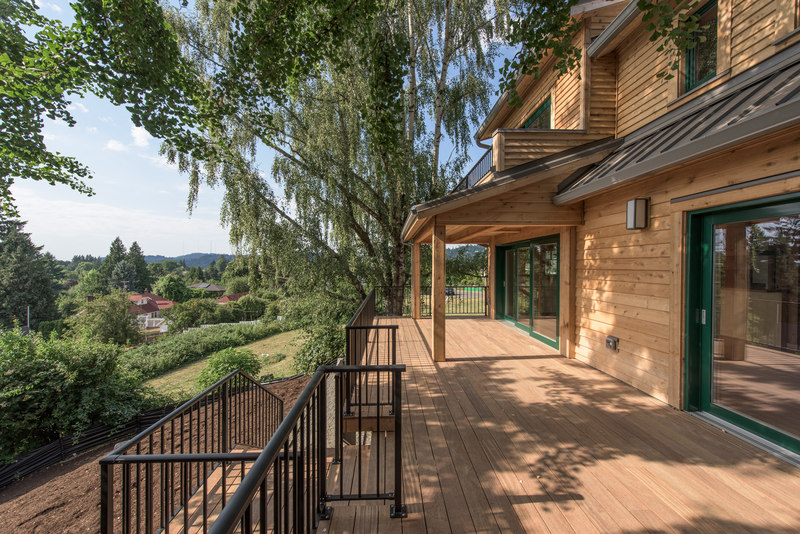 Located in a previously developed urban neighborhood of Portland. Renewable Energy System Description & Details: To offset the energy usage, a 7KW solar array will be installed on the garage. Rebuilt the entire shell and thermal boundary to increase insulation values and tighten the air barrier. 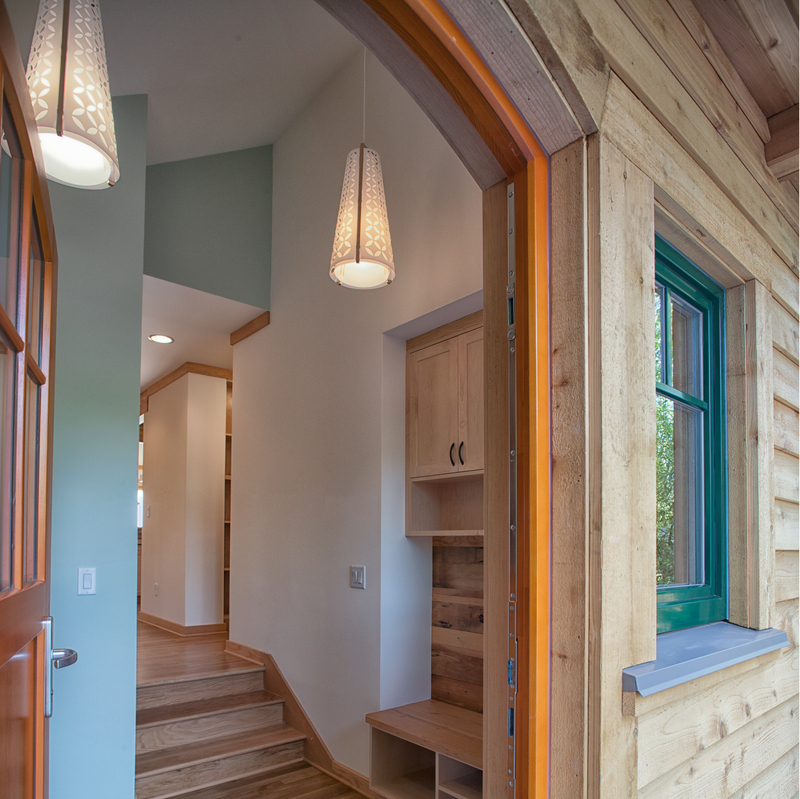 Triple pane, wood/clad Zola windows and doors were used, including 3 large lift slide units. The average U value of the windows is U.12. The windows were installed into the rough openings with Hanno Band expanding foam tape. Blower door test performed on home. HRV balanced and commissioned. The architect, R&B Design studios designed the basic form of the house and Birdsmouth Construction(BMC) designed the foundation, wall, and roof assemblies. The design was integrated with the engineer, architect, builder, and Client. The HVAC system was designed by both BMC and the HVAC company, Petra Heating and Cooling. Interior finishes and room layout were designed by the architect with input from the client. Material selection for the wall assemblies was chosen by Birdsmouth. Many iterations of the design were hashed out in our offices with all of the parties over several different meetings. Subcontractors and trades were invited to these meetings, and their input in terms of performance, construct-ability and cost were all taken into consideration, and many of these suggestions were employed in the final building. The walls were constructed using an all-wood assembly. By avoiding the use of foam insulation this should allow for future retrofits and re-use of the materials in the house. Also, by using an all wood assembly the materials, should they be deconstructed in the future, can all be re-purposed or recycled into future building materials or mulch. For the most part, the goals for the project were met. 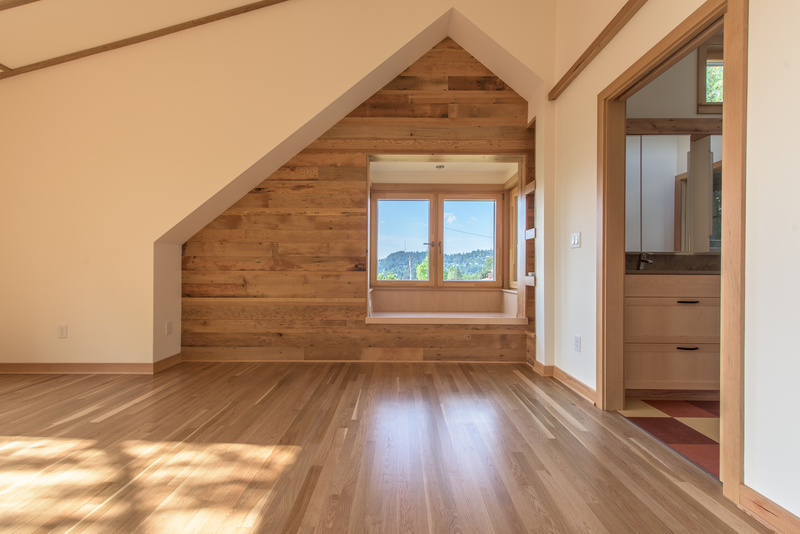 The client's wanted a healthy, durable and quiet home that uses very little energy. They also wanted to re--purpose as many of the reusable materials that were salvaged from the previous home on the site. Brick from the old chimney was re-purposed into the patio pavers; fir beams were re-purposed as posts in the main level; old studs were milled down and used as wood mosaics on the walls. With the exterior cork insulation, triple pane windows, and thick walls the house is extremely quiet. It is also very comfortable- there was a hot streak during the summer, right after the project was completed and they were perfectly comfortable with just night flushing and didn't use the mini split for AC at all. The air-tightness standard on this house was measured at 0.5 ACH50. We were initially concerned that this would be hard to meet given the geometry of this building. It is a craftsman style with multiple roof pitches, valleys, ridges, bump-outs, and elevation changes. Through the use of Zip System sheathing for our primary air barrier, coupled with a liquid applied Prosoco system for air sealing we were very happy with the results.The continuous exterior insulation also helped us reduce a lot of potential for thermal bridging at these geometrically challenged areas of the home. We did also learn that the addition of the insulation and drywall had a much smaller impact on the airtightness than we had thought it would. We did see an increase in air-tightness, but only by 10-20 cfm. Good to know for future projects in case we have to meet a specific tightness standard- specifically we know we can't rely on much air tightening by the progression of these stages of a project. The use of a Zehnder Comfo-air ERV turned out to meet the clients goals for quietness as the unit is barely even perceivable even when boosted. Additionally, the mini split heat pump is quiet and unobtrusive, again meeting these high level goals for the client. The Clients did want flush thresholds at the doors to the exterior decks, and porches. Due to the need for a thermal break and the nature of the high performance doors this was difficult to achieve. Even though we set the doors down into the floor assembly to reduce the thresholds as much as possible, there was still a roughly 1" drop at this junction. 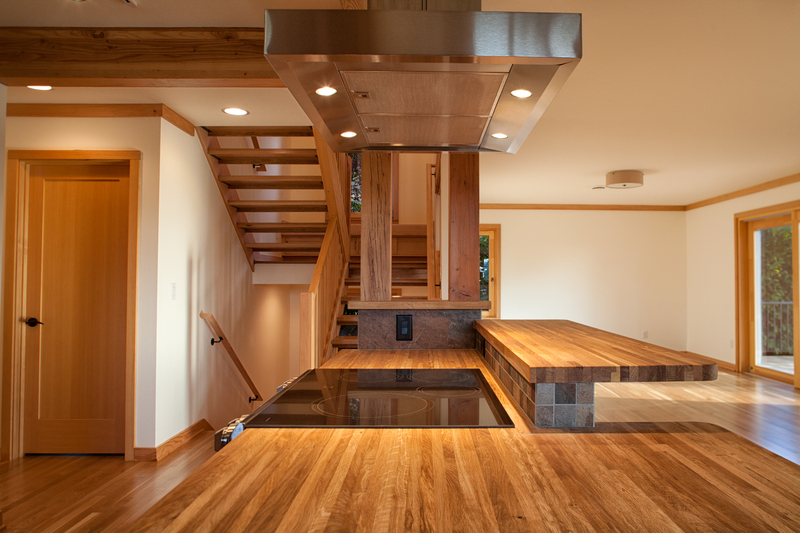 One of the design goals was to have a table that could span from the interior through a triple lift slide door and onto the back deck. This can still be done, but does require a few shims on the table legs to account for this difference in grade. We have installed embedded temperature sensors, room temperature sensors, relative humidity sensors, and are monitoring the electrical usage of all circuits. We look forward to getting these results when they come in (currently, the system is not fully functional.) Anecdotally, we have heard that the house is not overheating, nor experiencing any discomfort. They energy bills have trickled in, but haven't been studied as of yet. $5,000 builders incentive was provided by Energy Trust of Oregon.